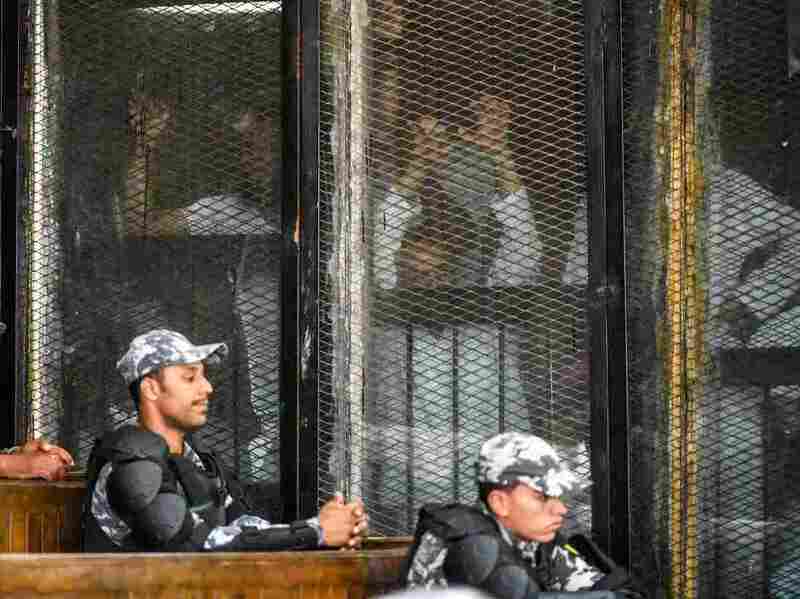 Prisoners including members of Egypt's banned Muslim Brotherhood wait inside a glass d ock during their trial in Cairo on July 28. Egypt's courts have held mass trials of hundreds of defendants, sentencing many of them to death. The Trump administration's recent decision to release $195 million in military aid to Egypt has left rights experts stunned and deeply worried. A year ago, then-Secretary of State Rex Tillerson suspended that sum because Egypt's human rights record didn't meet the standards imposed by Congress. Since that time, the space for civic freedoms in Egypt has shrunk, researchers say. Egypt's security forces have continued to lock up groups labeled dissidents or terrorists, and courts have handed down mass death sentences in cases widely criticized as politically motivated. The U.S. aid reversal comes in support of a regime that researchers say is even more authoritarian than ousted ruler Hosni Mubarak. "This sends all of the wrong signals to the Egyptian generals that the rhetoric about human rights is merely lip service," says Mohamed Soltan, a U.S. citizen who spent almost two years as a political prisoner in Egypt until he was released in 2015. "It is a green light to carry on with the repressive policies." On July 25, the State Department said it decided to release the money because the Middle Eastern country has taken steps in response to U.S. concerns, but didn't specify what progress has been made. The funds are a fraction of the annual $1.4 billion U.S. foreign assistance to Egypt, one of the largest recipients, according to the Congressional Research Service. The military aid is for Egypt to procure defense equipment and training from the United States. Secretary of State Mike Pompeo (right) meets with Egyptian Foreign Minister Sameh Shoukry at the State Department Wednesday. Visiting Washington this week, Egyptian Foreign Minister Sameh Shoukry said on Wednesday that "Egypt is at the forefront in the fight against terrorism" and it welcomes the renewed aid. 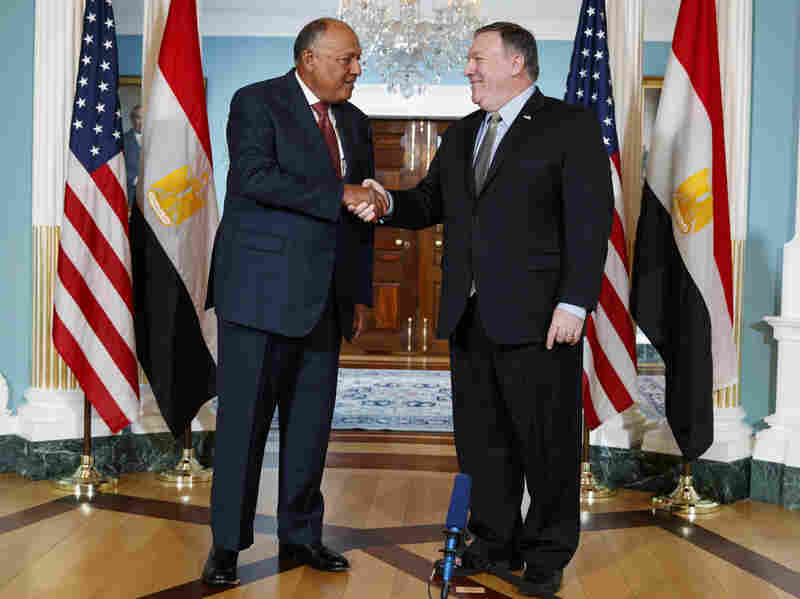 "The military assistance is appreciated and is fundamental and crucial to enable us to continue to eradicate terrorism and radical ideologies from the region as a whole," Shoukry told reporters after meeting Secretary of State Mike Pompeo and other senior administration officials. But the Egyptian government casts a sprawling net as part of its purge. "The Egyptian government has civil society by the throat, choking all criticism; we're close to the death of dissent," says Brian Dooley, a senior researcher at the Washington, D.C.-based advocacy group Human Rights First. Government repression in Egypt has grown since the military overthrew the country's first elected leader in 2013 and Gen. Abdel-Fattah el-Sissi later became president. "Under Sissi's reign, thousands of political dissidents have been killed, tens of thousands imprisoned and hundreds of thousands ex iled," Soltan says. "Lately, we have seen a spike in death sentences being handed down in internationally condemned mass trials." The latest mass trial, at the end of July, included 739 defendants. The court handed 75 people death sentences for their involvement in a 2013 sit-in. The more than 600 remaining defendants reportedly will be sentenced in September. They include U.S. citizen Mustafa Kassem and Egyptian photographer Mahmoud Abou Zeid. Both deny the charges against them, which include Muslim Brotherhood membership, illegal assembly at a political protest in 2013, possession of weapons and murder. Soltan says, by resuming military aid, the U.S. is relinquishing leverage it once had to influence policy and possibly the fate of prisoners in Egypt. 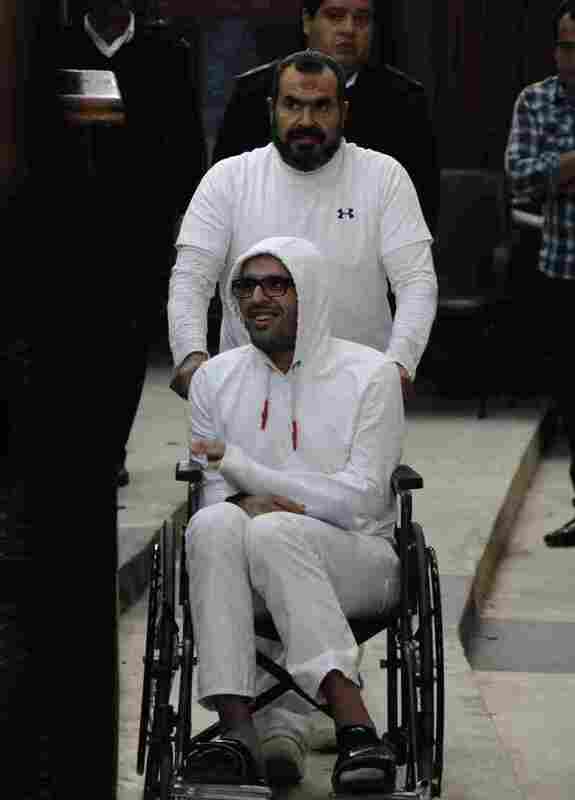 In this March 2015, photo, Mohamed Soltan is pushed by his father Salah during a court appearance in Cairo. Egyptian officials freed Soltan May 30, 2015. He had been sentenced to life in prison on charges of financing an anti-government sit-in and spreading "false news." Soltan himself was shot, arrested and sentenced to life in prison for tweeting at a demonstration in Cairo in 2013. His imprisonment was condemned by human rights groups and eventually â" after a 489-day hunger strike â" the Obama administration intervened to demand his release. Egypt ultimately succumbed to U.S. pressure: Soltan was freed in May 2015 after 22 months in prison and deported to the United States. "My release, among a few others, is proof the U.S. has leverage over Egypt with regards to human rights policies. The recent decision to release the withheld aid is a devastating blow to that influence," Soltan says, speaking to NPR from Washington, D.C.
President Sissi has expanded the government crackdown beyond so-called Islamist opponents. In April, he won re-election in a landslide, but had no real opponent. Most candidates had been either arrested or pressured to drop out of the race. The situation in Egypt is "dreadful, far worse than it has ever been," says Andrew Miller, who researches Egypt for the Washington-based Project on Middle East Democracy. Civil society and the media are also gasping for air, according to Dooley of Human Rights First, who visited Cairo last week. Dooley met with activists there who have been targeted by the Egyptian government. He says Sissi has passed laws criminalizing any form of free media and advocacy for human rights. Egypt has maintained that these laws are necessary to maintain stability and security. The Egyptian military has been fighting an insurgency in the Sinai region for the past few years, where groups allied to al-Qaida and ISIS have entrenched themselves. But as NPR has reported, extremist groups have used Egypt's prisons to recruit members. Former political prisoners have recounted how ISIS recruiters roam around the prison f reely. "This level of repression expedites the process of radicalization," Miller says. The U.S. government has long faced criticism, including from Congress members, for providing aid to Egypt even at times when it clearly failed to make progress on human rights and democracy. Since 1946, the U.S. has provided Egypt with more than $78 billion in foreign aid. But the current era of financial support goes back to a 1979 peace treaty between Egypt and Israel that came out of the Camp David Accords. These days, the U.S. government says it is assisting Egypt in part to help fight radicalization. But Miller says the Egyptian government's strategy is problematic. "They are using conventional military tactics and blowing up entire areas without engaging the local population, and this is making a lot of people angry," he says. Activists in Egypt have implored the U.S. to use its influence in positive ways and co ndition its military aid to Egypt on better human rights for Egyptians, according to Dooley. "Withholding aid was starting to have impact," Dooley says, "but now the U.S. administration has shown Egypt it just doesn't really care." Lama Al-Arian reported from Beirut. Michele Kelemen and Alex Leff contributed to this story from Washington.